Details relating to the Italian Commemorative of 2004. 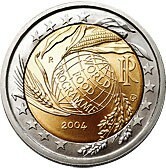 The coin celebrates the World Food Programme. The programme began in 1963 and the seat of the organization is in Rome. The aim of the programme is to ensure as far as is possible that those who are in war zones and catastrophy regions receive adequate food. In the inner circle is a globe, representing the earth, tilted to the right out of which sprout three of the basic food sources of the earth viz. wheat, rice and maize. These extend into the outer ring and divide the twelve stars of the EU into three groups of four. The effect, I think, is rather pleasing. On the right edge of the inner circle, the issuing country Italy is represented by an I superimposed on an R.
At around ten o’clock is the mint mark R and at the bottom the year of issue 2004. At four o’clock the initials of the engraver “UP” are shown in an artistic form that looks somewhat like a W.
New EU regulations stipulate that the outer ring has to be left solely for the twelve stars of the EU. It is felt that this better portrays unity within the EU. 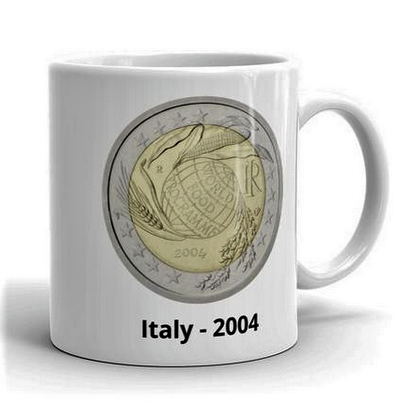 Return from Italian Commemorative 2004 to euro coin collector.